In her essay, “What is Freedom?”, Hannah Arendt explores the idea of virtuosity as it applies to freedom. But how does freedom come about in the first place? According to Arendt, underlying principles must first inspire action. These principles can be anything from equality to justice to solidarity. Then, “freedom…appears in the world whenever such principles are actualized; the appearance of freedom, like the manifestation of principles, coincides with the performing act” (Arendt 151). So once the action is started, freedom appears. Action in the public sphere is a performance, which means that freedom is produced by performance. Because virtuosity is a quality attributed to the performing arts, we can find virtuosos of action and freedom just as we find virtuosos in other areas of the performing arts, such as theater or music. Arendt believes the measure of virtuosity of someone performing in the public sphere is best determined by Machiavelli’s idea of virtù. Virtù is “the excellence with which man answers the opportunities the world opens up before him in the guise of [fortune]” (Arendt 151). So, Arendt’s measure of virtuosity is the ability with which one is able to act upon given opportunities. The acting men that are able to act upon these opportunities the best become virtuosos. These virtuosos are then entrusted with a duty. Just as freedom cannot outlast the performance that brings it into being, neither can the manifestation of the principles that bring about the portrayal of the freedom. For this reason, virtuosos must be always acting, whether it is through speeches or deeds. Otherwise, forward progress would never occur. Without virtuosos, the people at the forefront of political movements, there would be no action and, in turn, no freedom because men are only free as long as they act. However, virtuosos cannot act alone. Arendt proclaims, “performing artists… need an audience to show their virtuosity, just as acting men need the presence of others before whom they can appear; both need a publicly organized space for their ‘work,’ and both depend upon others for the performance itself” (Arendt 152). Virtuosos depend upon their audience; without them, they cannot show their virtuosity. The performance is collective. There is always an interactive element; the performance includes not only the performer, but the presence of other men and women as well. It can also be said that another duty of a virtuoso is to engage their audience and persuade them to start to act. The participatory element of the audience is what I am most interested in exploring. In this essay, I will examine three virtuosos, Abraham Lincoln, Martin Luther King Jr., and Cesar Chavez and the way that they were able captivate and move their respective audiences to action. Abraham Lincoln is a prime example of Hannah Arendt’s idea of a virtuoso. As a politician, he performed in the public sphere numerous times. In arguably his most famous speech, “The Gettysburg Address”, Abraham Lincoln engrosses his audience with his diction and charges them with the responsibility to help save the union of the United States of America. He reasons, “it is rather for us to be here dedicated to the great task remaining before us… that the government of the people, by the people, for the people, shall not perish from the earth” (Abraham). By inviting his audience to participate in helping the country, he inspires action and by doing so, inspires freedom. However, simply stating that American citizens must do something does not necessarily mean they will actually do it. He had to employ certain strategies to persuade others to accept their duty. One of his strategies that is particularly noteworthy is his use of the first person plural. Rarely, if ever, did Lincoln use the word “I”; he used “we” or “us” much more frequently. “He was not a visionary called upon to morally uplift, but a leader among free and equal citizens” (Field 52). He conveyed his thoughts on a plane where everyone could understand him and favored simple syntax instead of complex verbosity. on the Writing Style of Abraham Lincoln” that Lincoln’s style is called the “plain style”. It “represented a change in attitudes toward written language that came as a result of a number of different factors, circumstances that surely affected how Lincoln and some of his contemporaries wrote and how Lincoln approached language in written form” (Myers 352). This is important because Lincoln’s style allowed him to connect his constituents better than others before him. His manner of speaking and writing could be attributed to the fact that he was an autodidact; perhaps his background enabled him to accurately convey his ideas in a convincing way for a larger audience. 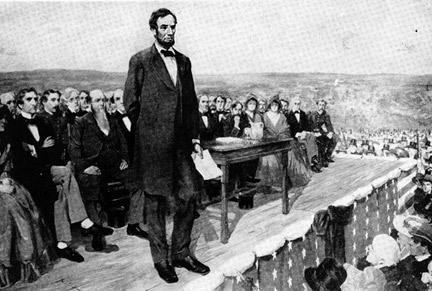 Though his “Gettysburg Address” only lasted around two minutes and only consisted of ten sentences, Lincoln was able to give a performance that roused support for making the United States of America united again. Lincoln can be seen as a true virtuoso because he did not simply espouse his ideas and plans of action haphazardly. Instead, he used certain tactics to strengthen his performance, which consisted of delivering his ideas in a way that would inspire others to act along with him. This is especially important because freedom can only come out of action. It is not present before or after action takes place, so by engaging his fellow citizens, Lincoln was able to help them move towards freedom. Another man who can be considered a virtuoso is Martin Luther King Jr. King’s performance in the public sphere, throughout the 1960s, catalyzed the civil rights movement in the United States. He came to be the principle narrator of a history in the making, and in this way he exemplifies Arendt’s understanding of the virtuoso. His embodiment and performance of freedom inspired not only the black community in the United States, but the American people in general. Much like Lincoln, skillful and inspired use of rhetoric is the key component of his performance. However, Lincoln and King’s styles were practically the opposite of each other. Regardless, King was just as able to capture the attention of and to persuade many people through his performances with the use of his eloquent oratory. His virtuosity is demonstrated by the impact he was able to make through the amount of people he was able to motivate to action. Nick Sharman elucidates some of the rhetorical strategies that King employed to do this in his essay “‘Remaining Awake Through a Great Revolution’: The Rhetorical Strategies of Martin Luther King Jr.” Instead of proposing a plan of action for the civil rights movement, King instead gives examples of ideals that should be followed to create a more equal and fair society. He did this so that he would not alienate anyone. It is much easier to relate to principles than to specific legislation (Sharman 88). After all, principles are what inspire action in the first place. Another scholar, Mark Vail notes that part of what makes King’s speeches so powerful is that he captures the mood of the time. Even contemporary readers can feel the energy and the passion of the civil rights movement. King can capture the essence of the time with his careful choice of language. For instance, during his “I Have a Dream” speech, he hopes that “Mississippi, a state sweltering with the heat of injustice and sweltering with the heat of oppression will be transformed into an oasis of freedom and justice” (Dream 3). The strong diction that he uses, such as “sweltering” and “heat of oppression”, gives his audience a true idea of the fiery and volatile nature of the attitudes in the state of Mississippi. Vail also notes the integrative style of Martin Luther King’s speeches. King did not just focus on one issue relating to civil rights. He acknowledged that African Americans needed both social and economic justice. The “arrangement of his familiar pastiched set pieces serve[d] as a type of voice” that integrated these two issues (Vail 64). Another hurdle that Dr. King had to overcome was showing people the “sacred certitude” of these highly political issues. One of the strategies that he used to do this was employing biblical allusions. For example, in many of his speeches and his letters, King references the Book of Amos in the Bible. Towards the end of his “I Have a Dream” speech, he proclaims “No, no, we are not satisfied, and we will not be satisfied until justice rolls down like waters and righteousness like a mighty stream” (Dream 4). In the New International Version of the Bible, Amos 5:24 reads “But let justice roll on like a river, righteousness like a never-failing stream!” This was effective because most Americans were, and still are, Christian. In the 1960s, when King made his speech, it was common to study the Bible and know most of the verses. By including biblical references, King is able to connect with his audience and make it increasingly difficult to not identify with his idea of biblical justice. The ideas of biblical justice and righteousness were powerful because they overpowered the concepts of convention and tradition that ruled this point in history. His allusions brought attention to the moral and ethical wrongness of the segregation laws and overall attitudes towards African-Americans at the time. King’s reference can also be seen as a prayer of sorts. He is appealing to the higher power of God to help the oppressed in these times. Another part of King’s strategy lies in the way that he delivers his message. He does not simply rush through his words, but instead speaks methodically and melodically, almost like a song. He also raises his voice to emphasize points and uses the speed of his words to manipulate importance of an idea. This can be seen in all of his speeches, but especially in the one that he gives in Memphis, Tennessee during the time of the Sanitation Worker Strike (Mountaintop). In this clip that is toward the end of his speech, King pauses to allow time for the audience to fully absorb his words and to respond to what he is trying to say. In addition, these pauses add gravity to his ideas. At the end of his speech, we can clearly hear and understand the positive way that the audience responds. His virtuosity and excellence of performance allowed for his listeners to completely understand and believe what he was saying. This gave his audience even more of a reason to want to start acting and participate in the civil rights movement. Martin Luther King is a perfect example of Hannah Arendt’s virtuoso; he not only took action, but also encouraged others to act, and through that, helped people become free. Cesar Chavez is another well-known virtuoso who led a movement for the better treatment of farm workers and Latin American people in general in the 1960s and 1970s. Like Dr. King, he was an acting man who performed in the public sphere inspired by principles such as equality and justice. However, his actions were not as speech-focused as Martin Luther King or Abraham Lincoln. Instead, he acted in the form of boycotting companies, fasting, and setting up marches to get the results he wanted for people. A large part of the reason that Chavez devoted his life to fighting for better working conditions and pay for farm workers was his childhood. His family was composed of migrant farm workers who often had to work in unfavorable conditions for long hours. (Cesar). Because he knew the situation of farm workers first-hand, he was more easily able to relate to the problems of laborers and could connect to them. This was an important part of his ability to garner support for his efforts. In 1962, Chavez started an organization that would later become UFW, United Farm Workers. By the end of the decade, the United Farm Workers had 50,000 members. The UFW made large impacts by boycotting certain growers and companies. They often made such a large impact that they were able to get new contracts signed for better wages. For instance, in 1970, Roberts Farms, Inc. agreed to recognize the UFW as a union and provided a $1.75 an hour minimum for their workers. The wages would go up 10 cents an hour the next year and up 15 cents the year after that. Although the wage was still low, it was much better than before. In addition, Roberts Farms agreed to putting money into a special medical program that most of the union members used (Bernstein). All of this was accomplished by a simple boycott inspired by the principles of solidarity and equality. The fasts that Chavez did were also effective in that they got much publicity and were seen as a steadfast stance against the horrors of labor worker treatment in the United States. Through his non-violent political action, he garnered the support of established civil rights proponents such Reverend Jesse Jackson, Martin Sheen, Danny Glover, and Whoopi Goldberg. In fact, many of them continued his fast for him after could not go any longer without food (United). One of the largest actions that Chavez took was organizing a 340-mile march from Delano to Sacramento in 1966. 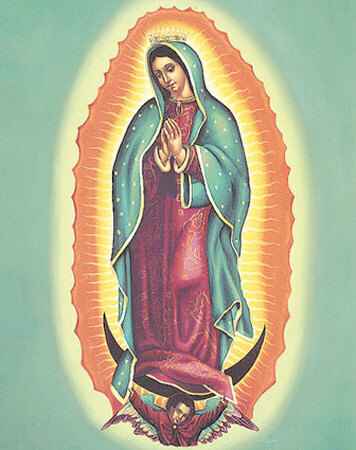 A way that Cesar Chavez rallied people behind his cause was through the use of the religious symbol of the Virgin of Guadalupe. A banner portraying the Virgin was at the front of the march at all times. “Using the image of the Virgin was a powerful appeal to religion and history for most of the farm workers; indeed it seemed to say, ‘God and history are on our side.’” (San Francisco). Perhaps, like Martin Luther King, Chavez used this strategy because he knew that people could more easily sympathize with the movement if they had someone beyond the human realm that seemed to be supporting it. By gaining so much momentum behind their movement, the march eventually resulted in the Schenley Vineyards giving the workers better wages and better working conditions. Overall, Chavez was able to achieve many things in a relatively short period of time. However, Chavez would not have achieved all of his accomplishments alone. Like both Lincoln and Martin Luther King, the audience that he was performing in front of was essential for anything to happen. Without them, the Delano grape strike would not have been as successful. Without them, his hunger strikes would not have gotten as much publicity. Certainly, the march from Delano to Sacramento would not have been as triumphant without the many people that joined in to support Chavez and his ideals. It can be seen that having a virtuoso as a part of any movement towards freedom is necessary. The virtuoso helps keep the movement alive through his or her action and is the person that all eyes can point toward for inspiration. Because freedom in the form of acting men produces miraculous changes, ultimately, all of the results of the virtuosos’ actions can be considered miracles. However, miracles occur much more often than would seem possible due to the inherent quality of man that makes him an acting being. This is why, once a virtuoso is gone, not all is lost. After all, Abraham Lincoln, Dr. Martin Luther King Jr., and Cesar Chavez have all died. Nevertheless, the principles that they stood for are still present today. The struggle for equality for all did not end, the push for civil rights did not stop, and the fight for fair treatment of workers is not gone either. This is because the most important thing a virtuoso does is to get other people to start participating. Virtuosos can produce miracles, but so can everyday people. By allowing ourselves to follow in a virtuoso’s footsteps, we too can make miracles happen. Their legacy of action can be continued and we can enable ourselves to be free. Arendt, Hannah. “What Is Freedom?” Between Past and Future. New York: Penguin Group, 2006. 142-69. Print. Bernstein, Harry. “Chavez Scores Major Victory, Signs Pact With Huge Farm.” Los Angeles Times 11 June 1970: 3+. Print. King, Martin Luther, Jr. “I Have a Dream.” Speech, Washington, DC, August 28, 1963. American Rhetoric. San Francisco State University. “The March from Delano to Sacramento.” Cultivating Creativity: The Arts and the Farm Workers’ Movement During the 1960s and ’70s. Labor Archives and Research Center, 17 Jan. 2006. Web. 12 Dec. 2013. Sharman, Nick. “‘Remaining Awake Through A Great Revolution’: The Rhetorical Strategies Of Martin Luther King Jr.” Social Semiotics 9.1 (1999): 85. Academic Search Premier. Web. 27 Nov. 2013. United Farm Workers. “The Story of Cesar Chavez.” UFW: The Official Web Page of the United Farm Workers of America. N.p., n.d. Web. 27 Nov. 2013.